I am blessed with two sisters: one is two years older than I, and one is two years younger. With doses intuitively mindful of efficacy and vital signs, these two women provide me shelter from, and exposure to the realities of life in equal measure. My younger sister, Aynsley, is a nurse at Swedish Hospital in Seattle. Her work days are filled gathering shreds of human dignity among physical wreckage, and weaving them together over gaping fears of obsolescence. Her accomplishments in the medical field of life improvement are given; the most humane nurse knows that glimpses of the abyss mutate more stealthily and predictably than any infectious disease ever could. Set in a preschool housed in a retirement home, Present Perfect is a story at once simple and intricate, about the poetry that lies in the day-to-day interactions between the very young and the very old- those at the beginning of life and those nearing the end- and ultimately, what those relationships can reveal to us all about the way we live now. While traveling through Turkey over the summer, a tour guide pointed out the absence of homeless people. Despite archaic aspects of Turkish society (a woman’s lack of choice in her own marriage, a caravan heralding the circumcision of a seven year old boy) I was stunned by this apparent triumph of civilization. Besides imploding my stereotype, Turkey’s minimal homelessness demonstrates the malleability of cultural landscapes. They seem static because we are standing on them, but in reality cultural landscapes are tectonically shifting positions made of well worn collective wisdom. I imagine a societal norm is born much like a regional cuisine, out of necessity mixed with ingenuity, bubbling up in all it’s messy ethnocentric and communal glory. If Turkey can show us how to make hummus, can she also show us how to house our people? What would happen to our cultural landscape if everyone had a home? 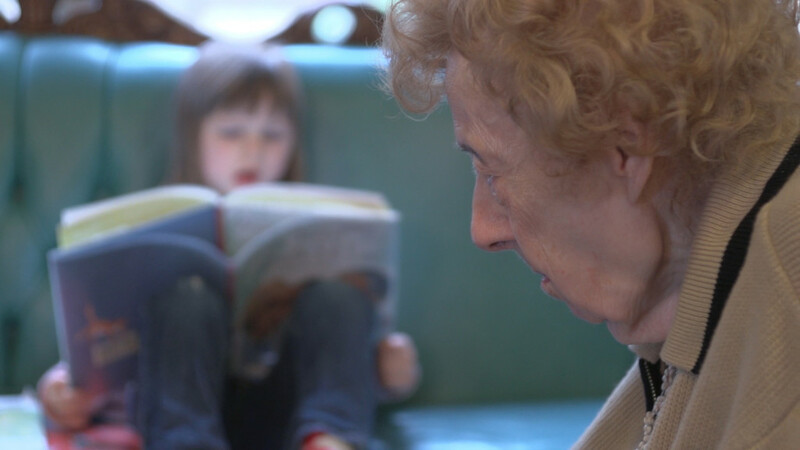 The inspiration for this film stemmed from a longstanding desire to explore the topic of aging in America. Stepping into most any nursing home, it’s hard to ignore the sense of isolation one feels on behalf of the residents living there, and even harder to reconcile that with the fact that old age will inevitably come for us all. Does it have to be this way? If my experience in Turkey has taught me anything, then I would have to say… no. Who knows where mindful, mature acceptance of aging will take us? I often wonder if our stubborn refusal to look death squarely in the eye, to absorb it for the intrinsic truth of life that it is, has something to do with our societal addiction to violence and gun culture on one side, and our inability to allow natural death (AND) on the other. A child who desperately needs sleep would sooner thrash about to distraction before laying himself down for a nap. Present Perfect is a gift, a new and improved recipe, gently stirring us into redeemed humanity. If you are feeling the groundswell of this shift in collective wisdom, would you consider joining me in supporting this film, either with a donation or by spreading the word? That we may be free to dance across every stage, here’s to the meaning of life. This entry was posted in Blog and tagged AND, Evan Briggs, homelessness, nursing, Present Perfect, Turkey. Bookmark the permalink. How lovely to see them woven together in your words. Keep sharing. It all matters. Thanks, Moo! Won’t it be great to be at the premier? I’m so excited for the unknown ripple effects of this new narrative. Wow, Dawg. I’m blown away by this. Thank you for catching my vision and sharing it! I was describing the film to Zane and Asa today as we passed Queen Anne Manor (they spent some time sharing poetry with the residents there last year with their wonderful first grade teacher Ms. Meck). They asked if you filmed it on your iPhone. I said no, she’s a professional and she used all her pro equipment. Beautiful ! ! I’m old enough to ponder these things (growing old and end of my life on earth) and I am greatly encouraged by the spirit and soul of Present Perfect. The redemptive energy in the relating of children and aged adults is inspiring and wonderful. I can hardly wait to see it. Great mission ! Thanks for chiming in, Billy! So happy to have your voice included on here, so articulately and succinctly expressed. p.s. I was just reminded of a promise I had made my Dad when he passed that I would do what I could to make nursing homes a better place to live:) I am in the process of writing an e-book about my father’s life in a nursing home and the beautiful story of my experiences with him his last 3 days of this physical life! Thanks for writing, Rosanna! I’ll be sure to pass along your message to Evan. Wonderful to add another voice to this worthy cause. Stirring and beautiful. Thank you! YES! YES! YES! THANKYOU for bringing this to the attention of so many who can be stirred up to make a difference and embrace the simple and lost concept of young and old together and incorporate it back into today’s society and fast-paced world! This affects EVERYONE to a certain degree! God created us for relationships and isn’t that what this helps to re-connect?! Yes, relationships. And so very beautifully weaved in positive, therapeutic, enhancing, and growing ways! Thank you!!!!!!!!!!!! Where can I find the conceptual foundational plan for implementing such a center where I live in Alabama? My heart is full and ready to come alongside to help make a difference!!!! This is a topic close to my heart. I was my mom’s guardian for the last 3 years of her life. She slipped and fell, broke her hip, was taken to the hospital via ambulance, and had surgery on her hip. I told the young dr. at the hospital that I thought the anesthesia pushed her over the edge from having “senior moments” or possible dementia into Alzheimer’s. The doctor told me that that is not uncommon–that, in her opinion, it happens a lot. A geriatric nurse told me she recommends older people talk with their doctors about alternatives to anesthesia if they are going to have surgery. She said it takes older people longer to recover not only from the surgery, but from the anesthesia, as well. Mom was combative, so only one nursing home in the Yakima area would accept her. I felt the staff was loving and caring, but that they needed more education about nutrition, dementia/Alzheimer’s, and other things. I like the idea of having the children at the nursing home. When the teachers at the Seattle public schools were on strike and the parents couldn’t find childcare and had to stay home with the kids, I thought it would be a great idea if the senior citizen centers would let the kids come there. My idea fell on deaf ears. The people I talked to were content playing cards 2-3 times a week or even every day. I was bored out of my skull there. The place was making me old before my time. I liked it at first. I lost my job in 2008 and started going to the senior center one year later for lunches, then to use the computers. I’ve always liked old people, and there were many there whom I really loved. It was hard on me when so many passed away, and then my mom passed away. I remember one man there, Tom, was absolutely delighted when the preschool-age son of a staff member would be there. It would take some careful planning and organization, including things like background checks of all the seniors, before the school children could be brought there in the event of another strike or whatever, but I still think it’s worth a try. They could start on a smaller scale–some kids coming after school and getting help with their homework while enjoying some cookies and milk or a sing-along. I saw so many depressed, lonely seniors, and frankly it made me angry that the director seemed only interested in doing the same old thing that they’d done for decades–play cards, play bingo, serve soft, mushy vegetables. Senior Services of Seattle aims to bring in younger and younger members, but I doubt that they’ll hold the younger members’ (50+) interest. As I may have already said, the place was making me old before my time–and depressed. That’s the way my mom was at the nursing home–depressed. She slept most of the time. The nursing home supposedly had a dog onsite to bring some joy, but I learned the dog was the director’s little dog and the dog was usually in her office when it was there. My mom would never sign a power of attorney because she was afraid we would put her in a nursing home. That’s why I filed a guardianship, because she didn’t have a power of attorney and I didn’t want her to become a ward of the State. Between my aunt and me, we had a pretty good idea of what Mom needed and wanted. Unfortunately, I was a student in Seattle and Mom was in the Yakima area and I was not financially able to visit her as often as I would have liked. My aunt, however, lived about a mile from the nursing home and visited Mom about once a week. After mom passed away, I started making more and more comparisons between the way things were run at the nursing home and at the senior center. Even though they said your input/ideas/suggestions were welcome, things went on in the same old way. Now I know why Mom never wanted to go to a nursing home. I am definitely onboard with this documentary and am so glad it is being made. Thank you! Thanks so much for sharing your story and experiences. It is strange when we come up against these unspoken divides and wonder how they got so impenetrable and why they were built in the first place! I love your idea of SPS partnering with senior centers. Where I live on QA we have two new enormous nursing home facilities under construction right now. I don’t like the thought of all these people moving here, only to be sequestered off from other human contact within the walls of a building. Keep putting ideas out there, and finding sympathetic people within the nursing homes who have seen exactly what you’ve seen, and I’m sure we can start shifting the tides. Dear friends, we need to connect with a senior center or assisted living home in NYC that would be willing to host a preschool or mixed age group of homeschoolers for an intergenerational learning program. This program is being started by one of our most exceptionally gifted teacher-entrepreneurs and all we need is the right space. There would be ample opportunity for the seniors to participate in the program as learners and teachers. Are any of you connected to a senior center in NYC? We need your help to do this amazing thing. Can you help us? Impulse Control, the Key to Gun Control? Connor Desai on Impulse Control, the Key to Gun Control? Becky Briggs on Impulse Control, the Key to Gun Control?